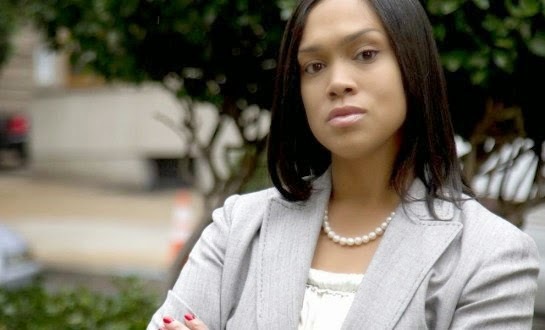 While Baltimore State’s Attorney Marilyn Mosby is seen as a rock star in the eyes of protesters decrying police brutality, her efforts to get justice for Freddie Gray are off to an embarrassing start. Not only did the prosecutor appear to get it wrong when she said the knife Gray was carrying was legal, which disproves her statement that he was “illegally arrested,” but it turns out her office actually charged two of the wrong people, according to The Baltimore Sun. And in the process, the lives of an elementary school cafeteria worker and a plumber have been turned upside down. Incredibly, the Alicia White and Brian Rice listed when prosecutors filed charges were not the intended Baltimore police officers by the same name, The Sun reported Monday. “The middle initial was off. Her address, her height, her weight, her driver’s license number – all of the information was my client’s information,” said Jeremy Eldridge, an attorney representing White. “Her life has been a living hell the past four days,” he said. Because of the mistake, White’s phone blew up Friday after Mosby charged six police officers in Gray’s death — members of the media and even bail bondsmen were trying to reach her, according to The Sun. Plumber Brian Rice told the newspaper he was also called multiple times by reporters. “If the city can’t even get the court charging documents right and innocent people are being harassed with phone calls from reporters and others, how will they secure a conviction?” he asked. And while the two unfortunate residents were not actually arrested, White’s attorney told The Sun officials showed a reckless disregard for his client, given the volatile nature of the case, and didn’t even bother to warn her. “In light of the violence and emotion our city has seen, to not send someone out and tell her, ‘Hey, we issued a warrant for you by mistake’ is unreal,” Eldridge said. The Fraternal Order of Police called Mosby’s decision to charge the officers an “egregious rush to judgment,” in part because she acted after having the police report all of one day. While Mosby appears to have already had her mind made up, perhaps she should have sat on the file another 24 hours to be sure she was charging the right people.